GUARDIAN ALERT911 :: Alarms & Sensors :: Logic Mark Inc. The Guardian Alert 911 is a tiny cordless speaker phone, small enough to be worn around your neck. It is smaller than most cell phones. By pressing a single button, the Guardian Alert 911 automatically dials the universal 911 emergency number. You will then be able to speak directly to the 911 operator about your emergency. 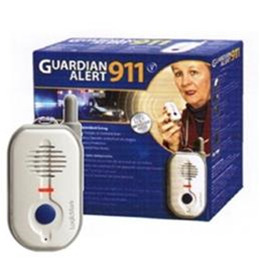 The Guardian Alert 911 System comes with a base station you plug into an existing phone jack in the center of the house. Eliminates monitoring fees, services charges, and term contracts. Talk directly to a 911 emergency operator at the push of a button. The Guardian Alert dials directly over your existing phone line to your local 911. Patient Pendant runs on a single AAA battery. Guardian Alert has enough range to cover most homes and the area close by outside. Pendant can be comfortably worn around the neck, clipped on a belt, or carried in a pocket at all times. To avoid accidental activation, the activation button is recessed and must be depressed for a minimum of 1/2 second to turn the phone on. The 911 Guardian works just like a cordless phone on any standard phone line with 911 service and tone dialing.